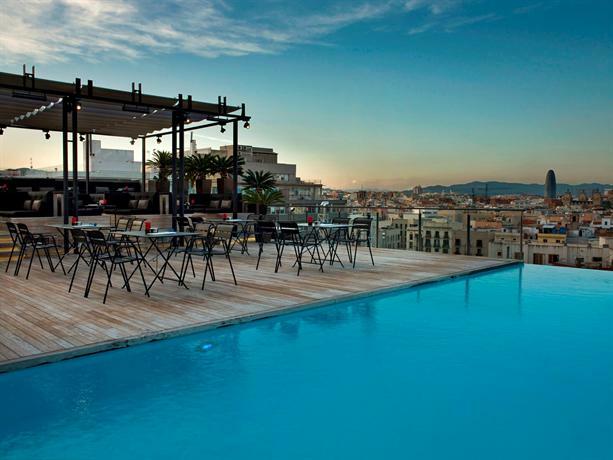 Located on 8th floor of the 5 star Grand Hotel Central the rooftop pool offers panoramic views of Barcelona's gothic district. The outdoor infinity pool features twin size day beds, wooden chaise loungers, and pool side bar known as Sky Bar. Sky Bar features a covered cocktail area, free wifi, and serves a variety of classic cocktails, fine coffee, and light snacks. The bar is open to hotel guests only from 9.30am to 8.30pm, and is open to the public from 8:30 p.m. until 1.30am.